We haven’t really had a chance to explore Glasgow properly so this weekend we will be out & about (weather permitting) to try and get a proper feel for the place. We still have a few weeks before supplies from Australia arrive so our work & cold weather wardrobe is rather limited for the moment (my three pairs of shorts are not quite so useful right now). We will be working together for the first time too – which will be fun! We will both be working on Design & Construct schools – not ideal work but good for an immersion into Brittish construction techniques. Our latest bus trip passed through some of the most fantastic scenery we have seen so far – huge mountains that slide down to meet wide rivers or drop straight into the ocean, paddy fields squeezed between the seas and the mountains and fishing boats lining the bays and estuaries. I was disappointed that we were stuck on our bus and couldn’t stop at some of the best spots – it would have made a great motor bike ride…maybe next time. Chhay and I have come to the conclusion that by far the best way to see this country is by motorbike or bicylce – there are so many interesting things to see on the side of the road, the little back routes are often the most picturesque and it gives you the freedom to stop or change your itinerary at will. One of the funniest aspects of travelling along Vietnam’s main roads is their approach to road widening (I know not the most interesting way to lead off a conversation – but here goes). Instead of reclaiming all of the properties that border the road and demolishing the entire buildings as would be done in the west they only knock down the parts of the houses that impeded their progress, leaving torn brickwork and concrete with the rest of the house intact. On yesterdays bus ride we drove for at least half an hour through an area that had recently been widened, it was quite surreal watching the remnants of people’s living rooms slip past the window one after another, different colours, stairways to nowhere, even pictures left hanging on the walls. Later we reached an areas that had obviously been completed earlier, there people had reclaimed the exposed spaces, a lichen of retail and small lean-to extensions submerging the raw brickwork. The funniest example of this phenomena we have noted in on the way to the airport in Saigon. 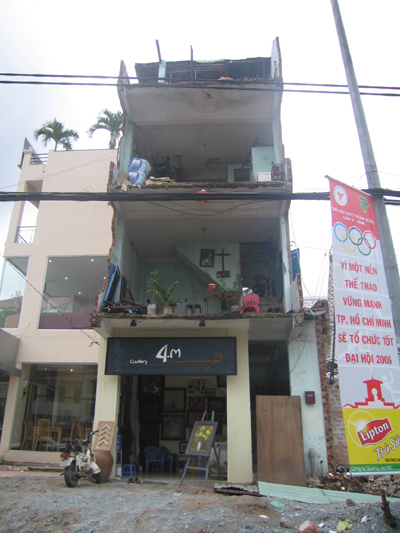 There a four storey house has been summarily cut in two, but rather than abandon the exposed rooms as is typically the case, the family is still occupying them – furniture, crockery and other odds and ends all on display to the passing throngs with nothing but some exposed reincforcing rods between them and the pavement below! Great to be back in sleepy ol’ Adelaide. Everything moves at a very pleasant pace here – and everyone is so polite – I’ve had to polish up my Brisvegan idiom. Everyone ambles along at just under the speed limit – it is quite a change to not get out of a car drenched in sweat and feeling like you’ve just lost a year of you life! That being said there is a definite lack of energy in the city, and the flatness and lack of density can be unnerving. Roads go on forever without change and there seems to be no horizon just more low set suburbia, more views of your neighbour’s fence. The food is still excellent, though perhaps not as cheap as we remembered. Had lunch at a delightful little place on Unley Road today whose name escapes me – a fantastic courtyard space and pleasant food. Followed this up with dinner at the Spice Kitchen – amazing combinations of spices (as to be expected from their name I suppose). We haven’t been back to Ying-chow’s yet to compare it to Brisbane’s Asian House – perhaps tomorrow. We are still tidying up some loose ends before we leave – it seems that every time I cross something off I remember another task to do! I’m not sure if we’ll get down to the land before we go – I would love to have some time down there to really chill out (quite literally at this time of year I think) but it is looking increasingly unlikely. There are some interesting new developments springing up around the city – a lot of very good medium density stuff and a few interesting apartment buildings. It is disappointing to see the commercial buildings that have been completed – they feel like lost opportunities, much like most commercial development in the city since the 70’s.